Best viewed in 720p. I'm player 1, Mark is player 2 and Dee is player 3. This was played using joysticks instead of a trackball, and on MAME the diagonals are slightly off making it harder to play. Unfortunately, at the end of the game, we didn't originally make it to the end before time ran out, so I used a save state to do it over so I could actually show the end. 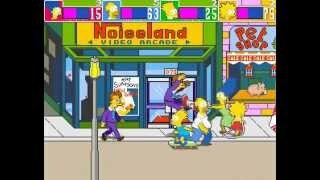 Welcome to the Simpsons Game! In this 100% guide, I will show off all collectibles and all time challenges! Hope you enjoy!LEVEL 8: Shadow of the Colossal Donut COLLECTIBLES (Homer): 9 Duff Bottlecaps COLLECTIBLES (Bart): 10 Krusty KouponsCLICHÉS:~ Obvious Weakness: Open Lard Lad's first hatch and disable his wiring. Over 100 Classic Capcom Arcade Games! Capcom is over 25 years old, and in that time created some of the finest arcade games ever; here are over 100 of them. How many have you played?